Adaptins are components of the adaptor complexes which link clathrin to receptors in coated vesicles. 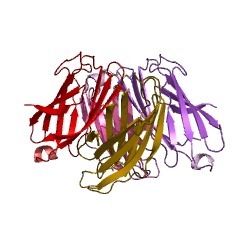 Clathrin-associated protein complexes are believed to interact with the cytoplasmic tails of membrane proteins, leading to their selection and concentration. 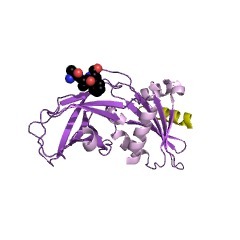 Gamma-adaptin is a subunit of the golgi adaptor. 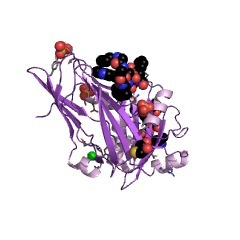 Alpha adaptin is a heterotetramer that regulates clathrin-bud formation. The carboxyl-terminal appendage of the alpha subunit regulates translocation of endocytic accessory proteins to the bud site. This Ig-fold domain is found in alpha, beta and gamma adaptins and consists of a beta-sandwich containing 7 strands in 2 beta-sheets in a greek-key topology (PUBMED:10430869), (PUBMED:12176391). The adaptor appendage contains an additional N-terminal strand. Proteins synthesized on the ribosome and processed in the endoplasmic reticulum are transported from the Golgi apparatus to the trans-Golgi network (TGN), and from there via small carrier vesicles to their final destination compartment. These vesicles have specific coat proteins (such as clathrin or coatomer) that are important for cargo selection and direction of transport [(PUBMED:15261670)]. Clathrin coats contain both clathrin (acts as a scaffold) and adaptor complexes that link clathrin to receptors in coated vesicles. 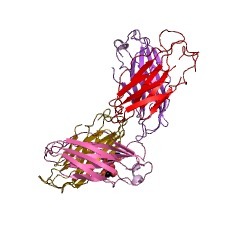 Clathrin-associated protein complexes are believed to interact with the cytoplasmic tails of membrane proteins, leading to their selection and concentration. 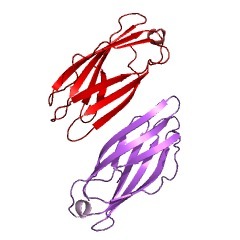 The two major types of clathrin adaptor complexes are the heterotetrameric adaptor protein (AP) complexes, and the monomeric GGA (Golgi-localising, Gamma-adaptin ear domain homology, ARF-binding proteins) adaptors [(PUBMED:17449236), (PUBMED:11598180)]. AP (adaptor protein) complexes are found in coated vesicles and clathrin-coated pits. 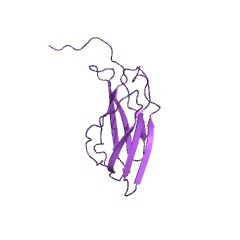 AP complexes connect cargo proteins and lipids to clathrin at vesicle budding sites, as well as binding accessory proteins that regulate coat assembly and disassembly (such as AP180, epsins and auxilin). 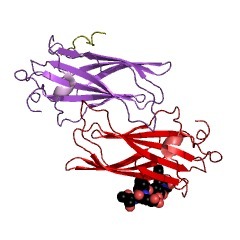 There are different AP complexes in mammals. 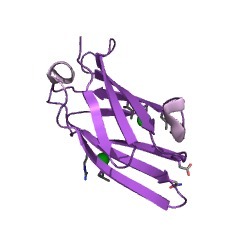 AP1 is responsible for the transport of lysosomal hydrolases between the TGN and endosomes [(PUBMED:15107467)]. 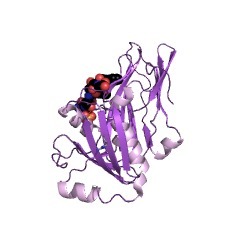 AP2 associates with the plasma membrane and is responsible for endocytosis [(PUBMED:12952931)]. 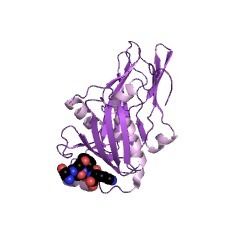 AP3 is responsible for protein trafficking to lysosomes and other related organelles [(PUBMED:16542748)]. 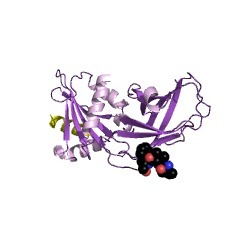 AP4 is less well characterised. 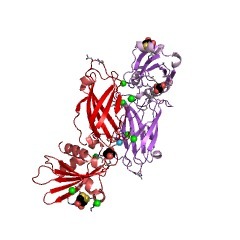 AP complexes are heterotetramers composed of two large subunits (adaptins), a medium subunit (mu) and a small subunit (sigma). 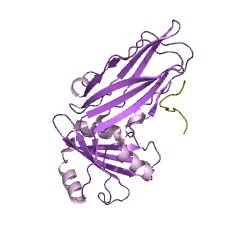 For example, in AP1 these subunits are gamma-1-adaptin, beta-1-adaptin, mu-1 and sigma-1, while in AP2 they are alpha-adaptin, beta-2-adaptin, mu-2 and sigma-2. Each subunit has a specific function. 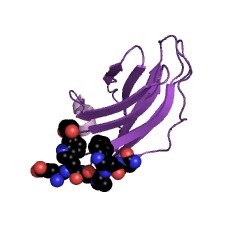 Adaptins recognise and bind to clathrin through their hinge region (clathrin box), and recruit accessory proteins that modulate AP function through their C-terminal ear (appendage) domains. Mu recognises tyrosine-based sorting signals within the cytoplasmic domains of transmembrane cargo proteins [(PUBMED:11080148)]. One function of clathrin and AP2 complex-mediated endocytosis is to regulate the number of GABA(A) receptors available at the cell surface [(PUBMED:17254016)]. 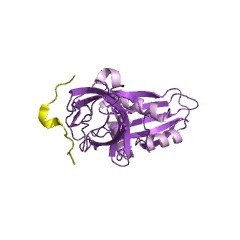 GGAs (Golgi-localising, Gamma-adaptin ear domain homology, ARF-binding proteins) are a family of monomeric clathrin adaptor proteins that are conserved from yeasts to humans. 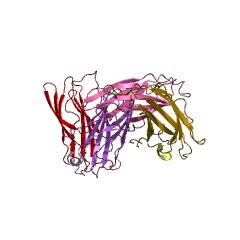 GGAs regulate clathrin-mediated the transport of proteins (such as mannose 6-phosphate receptors) from the TGN to endosomes and lysosomes through interactions with TGN-sorting receptors, sometimes in conjunction with AP-1 [(PUBMED:14973137), (PUBMED:14745135)]. 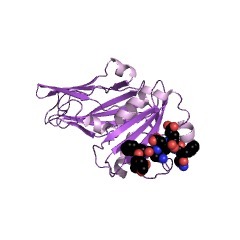 GGAs bind cargo, membranes, clathrin and accessory factors. 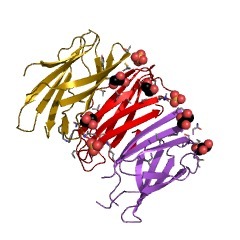 GGA1, GGA2 and GGA3 all contain a domain homologous to the ear domain of gamma-adaptin. 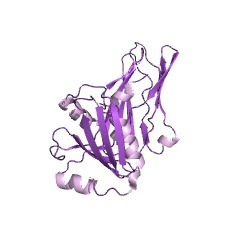 GGAs are composed of a single polypeptide with four domains: an N-terminal VHS (Vps27p/Hrs/Stam) domain, a GAT (GGA and Tom1) domain, a hinge region, and a C-terminal GAE (gamma-adaptin ear) domain. 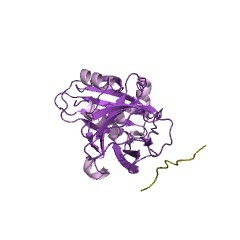 The VHS domain is responsible for endocytosis and signal transduction, recognising transmembrane cargo through the ACLL sequence in the cytoplasmic domains of sorting receptors [(PUBMED:11859376)]. 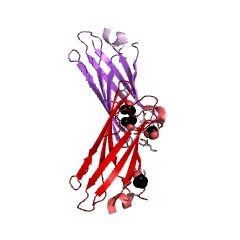 The GAT domain (also found in Tom1 proteins) interacts with ARF (ADP-ribosylation factor) to regulate membrane trafficking [(PUBMED:16413283)], and with ubiquitin for receptor sorting [(PUBMED:15966896)]. 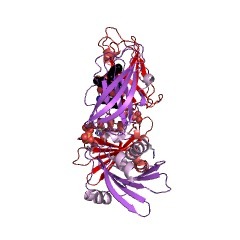 The hinge region contains a clathrin box for recognition and binding to clathrin, similar to that found in AP adaptins. 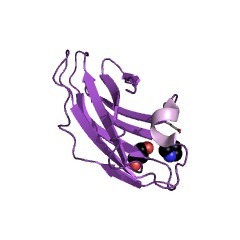 The GAE domain is similar to the AP gamma-adaptin ear domain, and is responsible for the recruitment of accessory proteins that regulate clathrin-mediated endocytosis [(PUBMED:12858162)]. 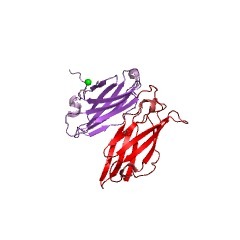 This entry represents a beta-sandwich structural motif found in the appendage (ear) domain of alpha-, beta- and gamma-adaptin from AP clathrin adaptor complexes, and the GAE (gamma-adaptin ear) domain of GGA adaptor proteins. 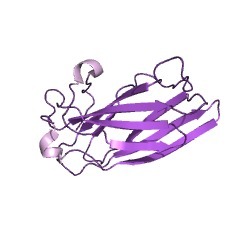 These domains have an immunoglobulin-like beta-sandwich fold containing 7 or 8 strands in 2 beta-sheets in a Greek key topology [(PUBMED:12042876), (PUBMED:12808037)]. 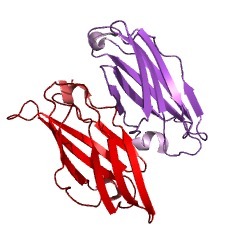 Although these domains share a similar fold, there is little sequence identity between the alpha/beta-adaptins and gamma-adaptin/GAE. 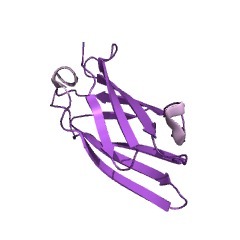 There are 7124 Alpha_adaptinC2 domains in 7120 proteins in SMART's nrdb database. Taxonomic distribution of proteins containing Alpha_adaptinC2 domain. This tree includes only several representative species. The complete taxonomic breakdown of all proteins with Alpha_adaptinC2 domain is also avaliable. 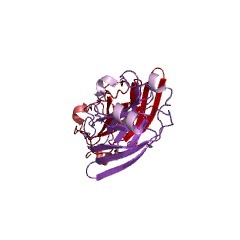 Click on the protein counts, or double click on taxonomic names to display all proteins containing Alpha_adaptinC2 domain in the selected taxonomic class. 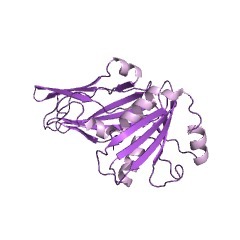 The AP1 complex is one of a family of heterotetrameric clathrin-adaptor complexes involved in vesicular trafficking between the Golgi and endosomes. The complex has two large subunits, gamma and beta1, which can be divided into trunk, hinge, and appendage domains. 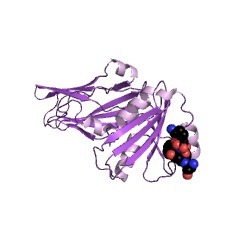 The 1.8 A resolution structure of the gamma appendage is presented. 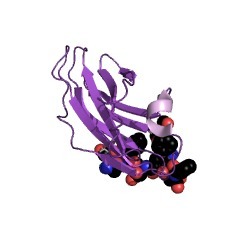 The binding site for the known gamma appendage ligand gamma-synergin is mapped through creation of point mutations designed on the basis of the structure. 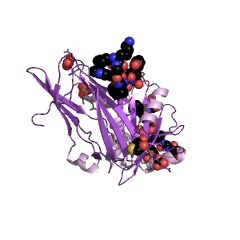 We also show that Eps15, a protein believed to be involved in vesicle formation at the plasma membrane, is also a ligand of gamma appendage and binds to the same site as gamma-synergin. This observation explains the demonstrated brefeldinA (BFA)-sensitive colocalization of Eps15 and AP1 at the Golgi complex.